Carla was looking for a miracle. Was started off as an ordinary Sunday, led to an experience with the Lord she would never forget. As a landscape and nature photographer, Carla often finds herself out in nature, marveling at God’s glory. "God made this world, and I know everything in nature is represented in his image.” On a Sunday in July, Carla woke up feeling like she needed more of Jesus. It wasn’t a rough day, a sad day, and nothing particularly unfortunate was happening. Simply put, she "wanted a special sign because I felt I needed an emotional boost, a big one. I wanted to see God show me anything He could to make me feel closer to Him and to have an image I knew He sent me that would boost my spirits; to show me He was there working on my behalf, and I would feel closer to him, therefore, becoming stronger spiritually.” So that morning, she asked God to reveal Himself to her through nature. She was running late for church, which was unusual, and felt a nudging to visit the beach instead. She kept driving towards Mission Beach and got out of her car to take in the evening. She walked along the beach, noticing all the people enjoying the evening as the sun started to set. A few minutes into the sunset she noticed something that she describes as “extraordinary.” The clouds seemed to take on the shape of an angel. 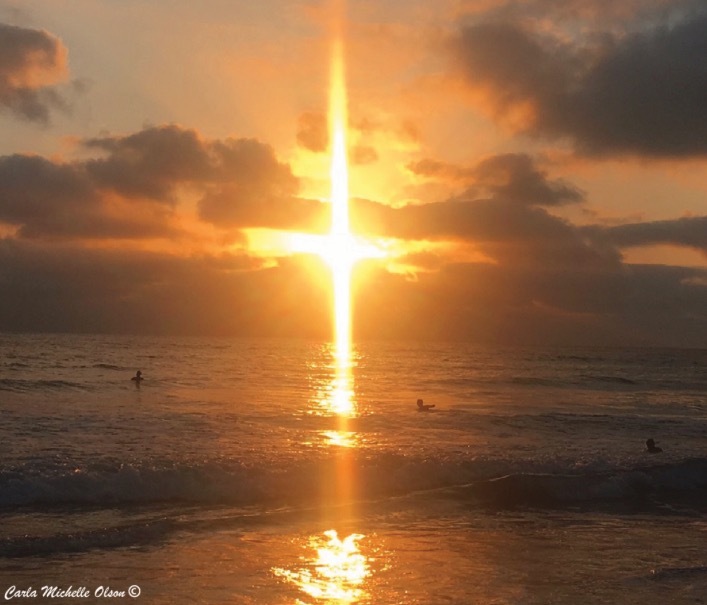 She got her camera out to take a photo, and just as she did, the light of the sun formed the shape of a cross. She was astonished. Psalm 19: 1-4 says "The heavens declare the glory of God, and the expanse proclaims the work of his hands. Day after day they pour out speech; night after night they communicate knowledge. There is no speech; there are no words; their voice is not heard. Their message has gone out to the whole earth, and their words to the ends of the world. In the heavens he has pitched a tent for the sun.” It was as if she was experiencing that Psalm right before her eyes. "I felt like He was listening to my prayer. He is so merciful and loves His children so much. He is there in many signs even though at times we wonder where He is; He is always there, we just need to pay attention, keep praying, be obedient to God, and working to be spiritually stronger every day." What started out as an ordinary day with a simple prayer of faith, led to a tender, yet powerful moment between Carla and the Lord where He showed her a bit of His glory. The sun rises and sets every day, and yet in our busy and distracted lives, it’s easy for us to let the wonder, the beauty, the miraculous details of God’s creation go unnoticed. Romans 1:20 says “For his invisible attributes, that is, his eternal power and divine nature, have been clearly seen since the creation of the world, being understood through what he has made. As a result, people are without excuse.” Carla’s story is a simple reminder that God is always with us. Always looking to romance us, speak to us, and move in and through us. We need only open our eyes.